A wave of Millennials are surging through the business world, causing corporate and HR executives to rethink recruitment and retention strategies. As we forge on into the future, we have to accept the fact that millennials are the future. They have been hailed for their creativeness and their ability to adapt to the every changing world of technology. They have also been criticized as being self-obsessed and prone to job hopping, but as we see it the entire generation is nearly of workforce age. This means that employers must compete for talent in a very different way than in the past. Millennials are the ultimate multi-taskers, and they are very tech-savvy. For these reasons, they expect flexibility in where and when they work. 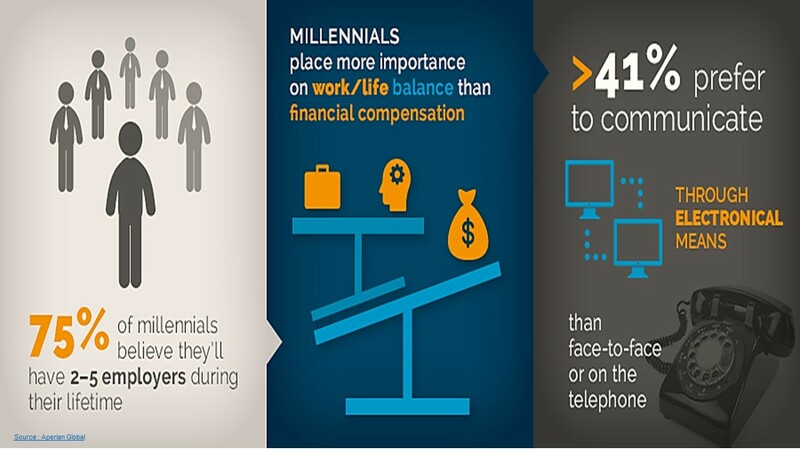 Millennials believe being tied to a desk from 9-5 is antiquated and unnecessary. Technology has evolved, making it possible to get work done outside of the office, and at any hour. Offering some sort of schedule flexibility is essential to retaining and engaging the millennial employees. Accounting for more than one-third of the workforce, millennials approach work differently than their previous generations. They have only known a world with an abundance of choice and convenience, therefor it is important to listen to the millennial group concerns and remain open to making any necessary changes—even unconventional ones. Another effective strategy for keeping millennial’s happy at work is supporting their innovative minds. With companies like Facebook and Twitter at the helm of today social media world, millennials have also grown up in an entrepreneurial, think-big world. This innovative spirit can be a great tool to taking your company to the next level. For many millennials, having a stable job, paying bills and owning a car and home is no longer a satisfaction. With these in mind, companies should create endless opportunities for millennials to get involved and offer their input. In doing so will, this instil purpose and reassure them of their standing in the company. By providing an opportunity for input, millennials will feel more invested in the company. 29% of all entrepreneurs are millennials aged 20-34 and as such there has been a steady stream of start-ups flooding the market since the early 2000s and with this brought about some famous millennials such as Mark Zuckerberg, the famous millennial who created Facebook, Jessica Alba, actress turned entrepreneur who created The Honest Company that is valued at well over $1 billion, Mike Krieger and Kevin Systrom, the creators of Instagram. Since as a whole we spend about 40% of our waking lives at work, it is obvious that social interaction in the workplace is fundamental to millennials in achieving an overall sense of wellbeing for in the workplace. In fact, ‘career wellbeing’—or liking what you do for a living—is one of the five essential elements of wellbeing. Staying cooped up in their cubicles all day without any interaction with co-workers isn’t good for building a strong team. There is a need to have some time to be able to walk around or hang out with co-workers to get to know them more on a personal level. This would help them understand their co-workers better, which in turn will improve team-work. There is no one-size-fits-all scenario to create the perfect environment for Millennials. Ask your Millennial team members what they’re looking for, find out what other companies are doing, create a company culture that values every worker, and be prepared to trust your gut when it comes to making decisions.